I’ve just finished reading through The Mobile Book by Smashing Magazine. The book is a fully packed 334 pages of analysis on the current state of mobile and best responsive design practices. Writers include gurus such as Peter-Paul Koch, Stephanie Rieger and Brad Frost. Bottom line: most people working in web design today should probably read this book, whether they’re designers or developers. The book has useful data on today’s mobile landscape, discussion on how to bake responsive design into our processes, the peculiarities of designing for touch and instructions on how to optimize for mobile. 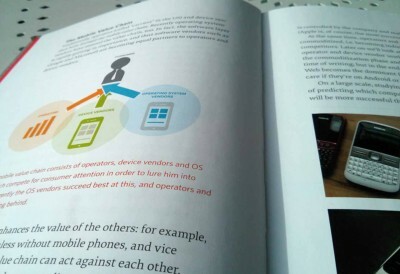 There will come a time when this book will no longer be necessary, when designing and developing for mobile will simply be part and parcel of every Web worker’s lot. But that time isn’t here just yet. The Internet of Things is a thing, and is likely to explode in the near future with more Internet-connected devices entering the market that are neither traditional mobile devices nor desktops or laptops. Some don’t even have screens. Responsive design that focuses only on screen size can result in huge downloads on mobile. We need to pay more attention to conditional loading of secondary content. Creating detailed Photoshop comps of web sites can set false expectations to clients and other stakeholders. Responsiveness should be part of the design process very early on. The capabilities of mobile browsers vary wildly (especially on Android), and browser/device detection is increasingly a necessary evil. RESS (Responsive design + server-side components) and server-side libraries like Detector (by Dave Olsen) are a possible solution. With new hybrid touch-enabled devices, we are less likely to be able to predict whether the user can use touch as an input method. Due to this we need to optimize for touch by default. Touch interfaces take web design into the realm of industrial design. It’s no longer just about how things look and behave, we also need to consider how people hold their devices. This has significance when deciding where to put key controls. The Mobile Book is available here. The print edition is probably the most high quality book Smashing Magazine has produced so far. A real pleasure to read! Regarding point 2 in my list: I’ll be presenting a simple example on how to use conditional loading for any content in WordPress in an upcoming post. The same method is used on this site to load the sidebar. Edit: it’s now online, see Simple Conditional Loading in WordPress. You may follow me on Twitter.